Students and professional winners of the Additive World Design awards. 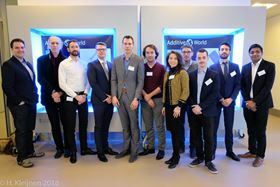 Valve maker Aidro Hydraulics and Fraunhofer Institute have won the Additive World Design award at the Additive Manufacturing Challenge run by 3D printing company Additive Industries. The awards were for redesigns of very common industrial parts where the impact of the design for additive manufacturing would be substantial and the companies winning design was for a generic hydraulic manifold for a street cleaning vehicle. The redesign has two parts, is smaller than previous versions, and reportedly has improved flow due to improved, curved channels. The problem of leakage caused by auxiliary plug failure is eliminated and the weight can be reduced by 70%. The student prize went to Yogeshkumar Katrodiya, an Indian student completing his masters at the Fraunhofer Research Institution for Casting, Composite and Processing Technology IGCV. Yogeshkumar designed an integrated shaft and gear with internal channels transporting lubricant to the gears for cooling. The helix shaped cooling channels were applied to increase the cooling capacity and the whole piece had a weight reduction of 50%. This story uses material from Fraunhofer IGCV, with editorial changes made by Materials Today. The views expressed in this article do not necessarily represent those of Elsevier.